Nation of Islam (NOI) leader Louis Farrakhan used his platform at the NOI’s Mosque Maryam in Chicago on Sunday to lead his audience in an anti-Semitic tirade. Go back to the Secret Relationship[Between Black and Jews] …White people are wise and the wisest of white people are the members of the Jewish community…They are wise and they are the guards of their own world. Are you mad with me for saying that? [Audience: “No sir!”] You can’t go nowhere in their world without paying obeisance to them. Farrakhan: How many of you are lawyers? Only have one in the house? No wonder we go to jail so much, brother. But at the top of the law profession, who are the top in law? Farrakhan: Sorry I didn’t hear you. Farrakhan: Any doctors in the house? Ain’t got no doctors? Oh there’s one way in the back. At the top of the medical profession, the top in that are members of the Jewish community. Anybody in media? Who’s the top in that field? Farrakhan: Anybody a rapper in the house? There’s rappers. You can rap, ain’t nothing wrong with that, but at the top of that are those that control the industry. Any of you have Hollywood ambitions, Broadway ambitions… Who’s the top of that? Farrakhan: Same people! They’re masters in business. Well I’m not a businessman I’m a banker. Well who’s the master of the bankers? 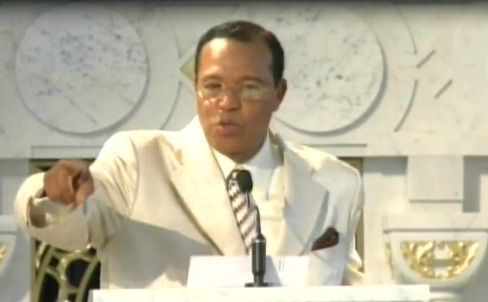 Farrakhan: You don’t discredit them because they’re masters, you discredit them by the way they use their mastery.